The TranzAlpine train journey from Christchurch to Greymouth takes four-and-a-half hours, and is one of the most spectacular rail journeys in New Zealand. It travels from the dry Canterbury Plains, through the mountains to Arthur’s Pass and the Ōtira tunnel, and then though rain forest on the West Coast. 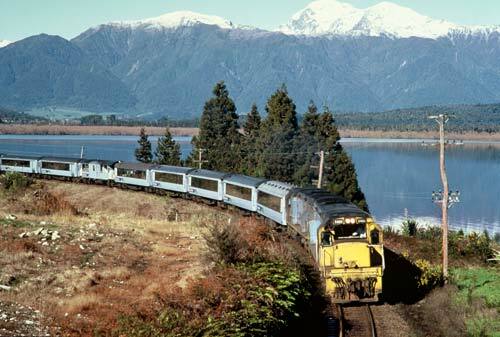 This view shows the train passing Lake Brunner (Moana), beyond which is the Taramakau valley, with the snow-covered Hohonu Range in the background.